With almost three decades of competitive and recreation sports experience, Christina Head is no stranger to the failures and successes of being an athlete. 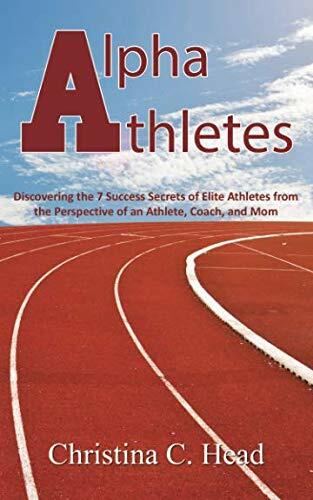 After watching her daughter struggle with balancing some of the elements of competitive sport, she decided to embark on a journey to discover some of the secrets of successful athletes. Why was it that some athletes seemed to go further or farther in their designated sport than others? Was it talent alone? What factor did heart or drive play in their success? There were so many many more questions and she wanted the answers. As she watched, researched, or had the chance to interview many different athletes, she began to notice similarities of the really successful ones. It didn't matter what sport they were in or what their backgrounds were, the result was still the same. There is a difference between a good athlete and a great athlete. There is an even bigger difference between a great athlete and a truly successful athlete. What Christina discovered in her journey was seven major success secrets that defined what she referred to as an Alpha Athlete. Through these seven successes any athlete can begin to tap into their true potential and perhaps even go beyond what they ever dreamed or desired! CHRISTINA C. HEAD Coach Chris is a mom, martial artist, coach, instructor, speaker and writer! She has been studying martial arts for over 28 years. She currently holds a 4th Degree Black Belt in Judo, 5th Degree Black Belt in Aikido, a 1st Degree Black Belt in Jyodo, and a Blue Belt in Jiu-Jitsu. She has trained in, competed, and coached in several sports including dance, softball, tumbling, powerlifting, bodybuilding, muay thai, and swimming just to name a few! She earned her Master of Science in Health and Physical Education Degree focusing in Sport and Exercise Science from Louisiana Tech University. Christina is also a Certified Nutritional Counselor and Certified Natural Health Professional. She has led seminars and coaching clinics. She has been a referee as well as a judge in several sports. She has given motivational speeches as well as led seminars on anti-bullying and self-defense. Christina has a passion for empowering people to reach out beyond their limits to find their hidden potential.